Educational Qualification-Full Time Degree in Electronics/ and Telecommunications/ Computer Science and IT. Educational Qualification-Full Time Degree in Electrical Engineering. Educational Qualification-Full Time Degree in Civil Engineering. Pay Scale-Selected candidates will be paid a consolidated monthly stipend of Rs. 17000/- during one year training.After training they shall be placed in the pay scale of Rs 20600-46500 + DA +HRA and other allowances. Place of Posting-Anywhere in the Operational area of MTNL. Age as on 21.03.2016-21 to 30 years. 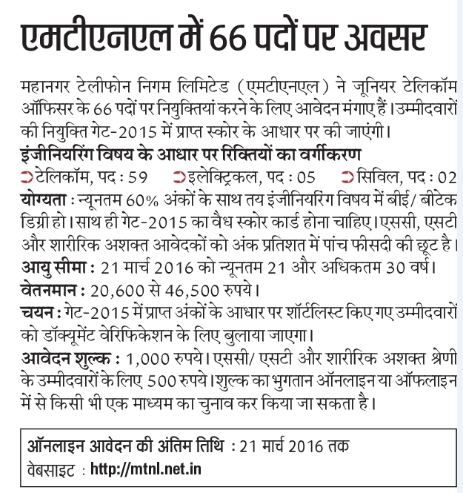 Last date-The last date for application is 21.03.2016.